Heartened that Fr. 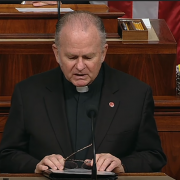 Pat Conroy's prayer for fairness and prosperity for all Americans in the new tax reform bill actually pierced the conscience of Congress, Robert Koehler calls on us all to continue the prayer for mercy, an end to violence, and humanity's moral revolution. As our profit-driven world becomes unlivable for the smallest creatures, Robert Koehler prays for insects and us, that we honor the sacredness of life. As a Lenten discipline, Lindsey Paris-Lopez will wear hijab in solidarity with Muslims experiencing violence at home and abroad. Jesus, after all, is Embodied Solidarity, and Lindsey hopes that wearing the headscarf will promote interfaith dialogue and peace as she follows Jesus in the way of compassion. "Our culture doesn’t prepare us for death very well." But Adam Ericksen has found comfort in a prayer that acknowledges death during some of life's most difficult challenges. Through ritual communion with God, "we can know that in life and in death, God is there with us." In the wake of the Charleston massacre, Matthew Distefano makes an honest prayer asking God to help all of us do our part to end racism and the satanic powers of oppression. Let us join the prayer and "confront these powers and principalities boldly."